On Mediaite: Glenn Beck is confident that the disaster in Japan has something to do with the End of Days, but exactly what that is is outside of his realm of expertise. Listen to more normal, humble commentary here. On Geekosystem today: film lovers and those looking for things to brag about rejoice: there’s a Google map, created using a new data management tool called Fusion Tables, that will show you which (if any) famous movies were filmed in your neighborhood. Check it out here. Styleite asks, would you like to look more like Marge Simpson? Who wouldn’t, right? 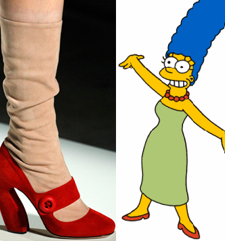 Luckily, they can also point you to the Prada heels that’ll make it happen. Go ahead — make all your dreams come true by clicking here (just be prepared for the ensuing heart attack once you get a look at the price tag). 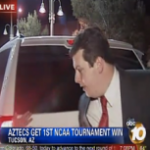 Sportsgrid has the latest in charming mistakes on local news, but this time the poor reporter is almost run over by a rogue SUV being driven by someone apparently wearing a blindfold. Luckily, no one ends up getting hurt, making it possible to giggle at the clip with a clean conscience. To see it, click here. On Gossip Cop today: Justin Bieber is growing a beard. Selena Gomez is not happy. To read more (and spend a few minutes trying to picture the Biebz with a Tom Selleck-esque ‘stache), click here. On The Mary Sue: Nathan Fillion, you have no business looking this good on the cover of Entertainment Weekly, particularly when posing like such a dork. None at all. To see the photo and read the rest of their Friday round-up, click here.